Perfect for keeping pet food, treats and bedding close to hand, this 8 litre Small Pet Bin is not only handy, but offers a stylish way to keep pet products neat and tidy. 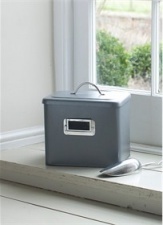 With a powder coated steel body and lid in attractive neutral Charcoal shade, it comes with a galvanised steel scoop and is finished with a metal handle. A chalkboard insert allows you to add contents or pet details.